She came, oh, she came in singing! I needed to go, to get out of here. These are not my people. I have to go home. He brought me a sucker from Donald’s store. We went riding in the country at sunset. I rolled down the window for a honeysuckle symphony! It sweeps over me. The rolling pasture grasses with their dotted cows. A fly or two, barely spotted in the lazy late day haze. Each tire whirls a dust cloud on this shadowbox of day. Then we took up our vantage for the sunset show. It never leaves us wanting. But we do want, still. I pick up a speckled rock or two. Fireflies lift a curtain for the night shift. I’m down the road a bit now. Daddy’s car moves on the face of the red clay sun. I reach out for him, and she takes my hand. And we dance. We move together to the sun’s conducting. It sets over my house, down behind the back porch under the hill. And I know these folks. I could not have been more unprepared for what I saw on the first day of my pediatric neurology rotation during residency. And I could not have been more profoundly affected by seeing it. My team had just walked up stairs to the Neonatal ICU to make rounds. Since the first time I had set foot in an NICU as a medical student, I had found the environment unsettling. Baby cries were drowned out by the noises of machines designed to support their life functions. Many of those little bodies were as sick as human beings could be and still remain alive. It didn’t seem right for lives so new to be in such peril. The sounds and smells drove one to fight or flight. In essence, many of those babies were in a state of fight or flight as well – the children of addicts, withdrawing from the chemicals which used to drown their mothers’ sorrows. No longer anesthetized, their developing brains seized in the terror/panic of a new reality without drugs, a reality in which they did not choose to find themselves. And there was no Mama or Daddy to hold them; none to calm the torment of those God-forsaken moments. As we passed through the entrance, then through columns of hospital cribs with their death-denying attachments, I saw another row which looked as out of place as baby beds in a nursing home. There, between two lines of newborn patients was a stand of old wooden rockers. That’s right – rocking chairs like those out front of any assisted living facility you might have visited. And they were adorned with well-worn quilts and blankets and seat cushions, just like the ones at grandparents’ homes. And what I saw next stole my very inhalation’s breath. Pot-bellied and balding with a halo of gray, and bespectacled in granny readers sat the surrogate, rocking his precious babe who twitched periodically through the dying down time of a fit. An eighty-something retiree, he and others volunteered several times each week to take a sick, abandoned little person in their arms and sit and rock with them and show them that the whole world is not the frying hot cauldron of Hell that was the airless tank into which they had been locked. And when the shaking finally stopped, and even before, something in the beating cells of each child had known that there is a warmth that does not fry, a voice that does not scream, a movement that does not tremble. The serenity in the faces of those elders as they rocked reached out and drew my soul into a place where the fullness of peace permeated all. What I saw there was so right and true that it obliterated all hatred, death, decay, destruction, abandonment, poverty, addiction, forsakenness, shame, hopelessness, hunger and despair. It was Love in action, the kind of Love that had lived and lost, died and risen again in one great infinity of “YES,” and it sat itself down in hard wooden seats with arthritic backs and it didn’t mind. Because that’s what Love does. Despite the cost or pain it just loves the least of all these children ’til they feel it. ‘Til they rest. ‘Til somehow, they’re well. As I left to tackle the work to be done that day and night, I took a last long look at those old folks, draped in their yellow gowns, gently moving to the rhythm each thought would calm their patient best. And I knew that every desperate child had reached for something. Perhaps they didn’t even know they had. But they reached. And needle tracks turned to age spots. And Mama came and rocked them, and made everything better. to find a little boy he knew but lost along the way. and tears plowed through those dusty rows to clear the way for Grace. that drove him up that stony road and shut away the gate. beneath a verdant canopy where mountain laurel grows. his thirsty soul drew sustenance, and Heaven was his dream. a wisdom gained in wandering had etched his stone with truth. to muster all remaining will and walk familiar ground. to wall away his brokenness the world could never know. who’d bravely fought marauding bands and shared in manly joys. he passed the spot where love’s first kiss had bade its beckon call. for supper and serenity, for warmth and welcome, too. he clasped the little hand of one he’d left those hills to save. began the upward trek to where a mountain meets a soul. the care-free boy left it ajar, as time was ticking late. Each ray of sinking sunset left its hue upon that place. Each dusty tear upon the cheek had cleared the way for Grace. the balm applied for broken life, Bright Canaan for the blest. The following are recollections of an art therapy session which occurred as part of the University of Alabama Honors Seminar Course, Art to Life, developed by Cognitive Dynamics Foundation. The course pairs students and persons with Alzheimer’s disease in an enriched relational experience, utilizing art therapy and reminiscence to reveal and preserve life stories and promote empathy for those experiencing cognitive impairment. In our second art therapy session of Art to Life there were six students in attendance who were enrolled in the course, one graduate journalism student and our student facilitator for the course. An art therapist conducted the session. Our participant was Mary, a 95-year-old with Alzheimer’s disease, nearly sightless from macular degeneration, but with one of the most joyful and enlivened spirits imaginable. Before the session our therapist had talked with me about the challenges of artistically engaging someone with poor sight. She had decided to try shaving cream art because of its use of the tactile sense, and thought this might be appealing to Mary. The therapist started the session with some life story discussion, and it flowed very naturally. Mary told us details about her family and we reviewed some of the life story she had relayed at the previous session. She told us about her father’s cotton farm, and about how the cotton was used for airplane wings. She mentioned that her husband was a pilot. Then the art activity started. Mary sat at one end of the table and the students filled out the rest of the space (the tables were placed in a “T” shape). Mary was then instructed about how to squirt shaving cream into the aluminum pan, to choose her food coloring, to place drops of her favorite colors in the shaving cream, and then to swirl the colors around in patterns of her choosing with a small wooden stick. 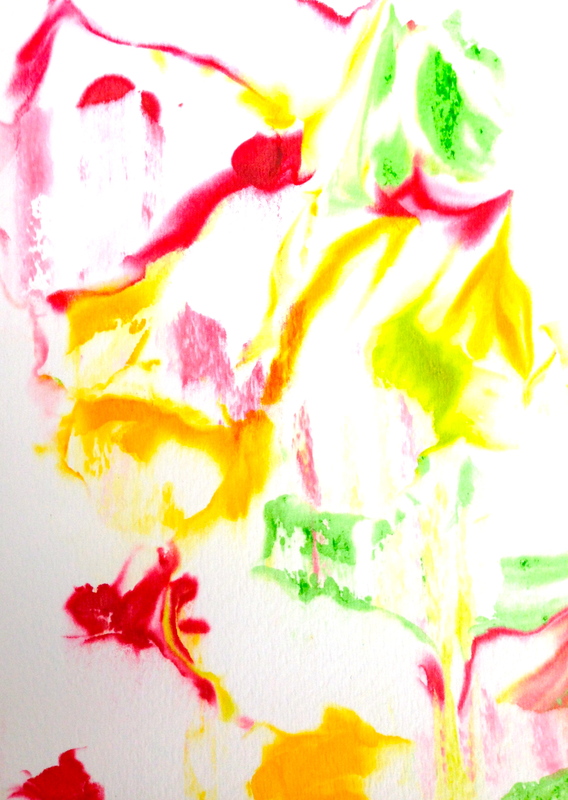 Then she was to blot a piece of watercolor paper into the mix, absorbing the color. At last, she would scrape off the shaving cream, leaving beautiful patterns of color in abstract form. She then began to talk about how this experience was causing memories to flood into her consciousness, and about how thankful she was for this. She tenderly spoke of her wedding day, and how the minister had started a custom that was apparently not being done at that time, of having the bride and groom turn and face each other to exchange vows. As she talked about turning to face her husband and exchange the promises, she cried. I could say so much more about the importance of that day. Mary was validated in her current reality, in that moment. She was creating again, and she was so thankful for that. Her spirit and memory were quickened by the experience, and she seemed to be possessed of life that transcended Alzheimer’s disease or any other limitation, and it kindled the life in each of us. We came to bring something to her that day. But we are the ones who got the benefit, the honor, the blessing. What a great privilege to have had that experience! After the event, one of the students said that, in the car on the way home, she and her friends began to open up and share in their own vulnerability, to talk about their heartaches and some of their trials, and to try to meet each other’s needs. She said that they were all perplexed at first, but then realized it seemed right to do this after the example set by Mary. They were entering into the vast expansive warmth of the self, shared in relationship with others. That’s what Art to Life is all about. Thank you, Mary, for sharing your art!